Apollo’s condition brought tears to our eyes. He was barely recognizable as a German Shepherd. 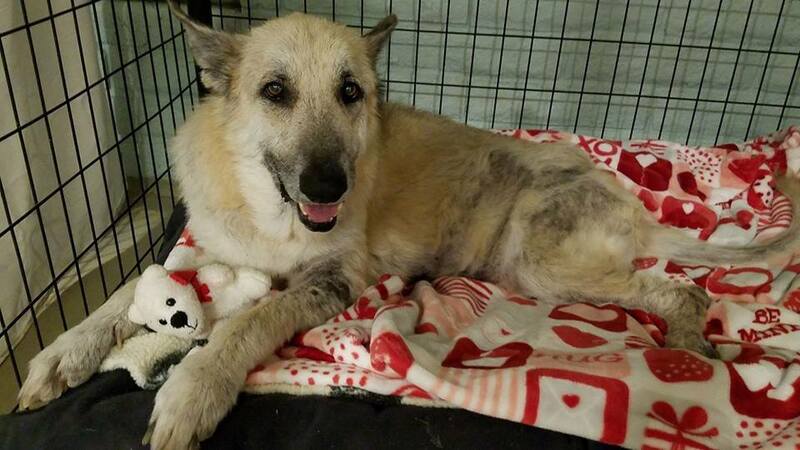 In April, 2018, the county shelter’s notes described him as “very old, very skinny, hair missing, strong odor, edema, potential endocrine disorder….. can’t tolerate anesthesia, humanely euthanize.” Pleas went out to save him. With the support PACC 911’s Golden Angel Fund, SPRAZ took in the failing senior. Apollo is also part of our Seniors For Seniors Program. Volunteers rallied providing him with all his needs. He was bathed, ridding him of the terrible stench, and all his head to toe wounds were cleaned. He was given a warm, soft bed and blankets providing relief to his bones, and a jacket for warmth having lost most of his hair. 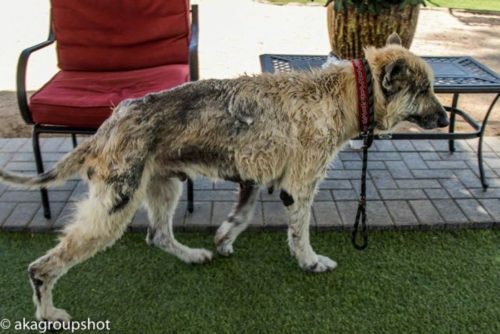 Emaciated and starving he cried in pain, struggling to stand or walk. With all the cruelty he’d suffered, all were amazed at his sweet, gentle demeanor. His skin biopsy revealed Pemphigus Foliaceus (PM) which causes raw, painful skin pustules and crusting. It is considered an autoimmune disease without cure, but with treatment may go into remission. Volunteers spent countless hours caring for the dog no one wanted. He has picked up weight and is no longer considered emaciated or neglected. 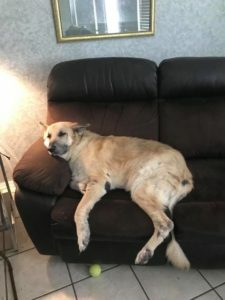 In July 2018 Apollo left for his forever foster home, where he is enjoying a great life with a family who loves him dearly. Happy tails, Apollo! Your life is so much better now.